The self-proclaimed “King of the South,” T.I. is focusing more on the changes he wants to see in his hometown, Atlanta, Georgia and impacting the lives of youth in a way most may never have imagined. The accomplished rapper, actor, and philanthropist developed his career based on his authentic character, evolving from the streets to later become a household name in hip-hop. Knowing the importance of giving back, especially to the community that he comes from, the rapper presented an opportunity of a lifetime for seven teenage orchestral students to perform alongside him in Washington, DC, for the popular NPR Tiny Desk Concert Series. 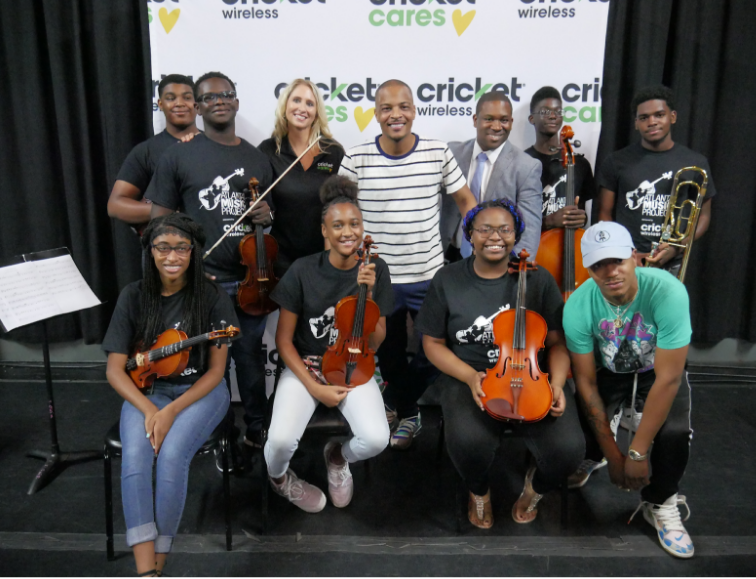 All of the teens are a part of the Atlanta Music Project, which provides tuition-free musical education for underserved youth in the community. T.I. recognized this opportunity as a precious one. “Here in Atlanta, the community that I know the best, that is near and dear to my heart, it’s important that we provide ways for the next generation to continue to build, shape and cultivate their dreams,” he says during a dress rehearsal before the performance. The high school performers include 14-year-old violinist Lailah Carter, 14-year-old cellist Brent Cameron, 16-year-old violinist Nyasjah Brooks, 16-year-old violinists Landon Wilkins and Nehemiah Wiggins, 16-year-old trombonist Core Jones, and 17-year-old violinist Ashley Gibson. Intertwining the sounds of classical music with the gritty sounds of trap lyrics, T.I. allowed the students to showcase their musical talents on a national platform and continues to prove why he’s known as a standup guy. T.I. is on the lineup for this year’s ONE Musicfest at Atlanta’s own Central Park. Purchase your ONE Musicfest tickets to see the rapper perform hits like “24s”, “Whatever You Like”, “What U Know,” and more.